There are fictional characters in Minecraft Pocket Edition about whom you have heard. Entity 404 is one of them and looks like a ghost with transparent eyes clad in cloak. Along with him there was Herobrine who had the same eyes but his plans were different. Many players doubt that he really existed, although there are many old screenshots of which he is captured. 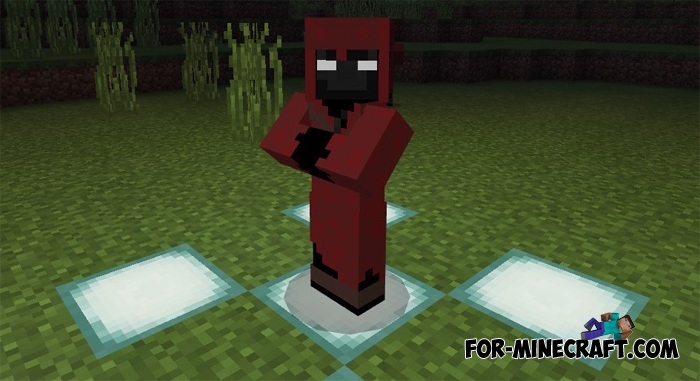 In fact, developers did not add him to Minecraft though.. Download the Herobrine Mod and you will see it. Entity 404 is a formidable boss whose task is to defeat you and your friends. He does not know mercy and will do his best to win the fight, and his army will help him do it. The addon has several interesting features such as new sounds and a modified drop. In that case, when you need a lot of gems, Entity 404 is an excellent simulator for honing your skills and an excellent bonus after winning.